Paragon's original 1911-4 was the machine that started it all. A machine with great Turn-of-the-century styling and 4oz anodized aluminum kettle makes the best popcorn around. 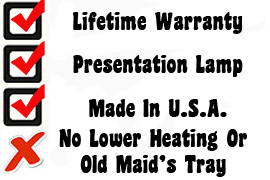 This machine offers a stainless steel food zone and bright popcorn graphics.The 1911-4 popcorn popper features witches are on the back of the machine for easy operator use. This machine offers a one year warranty. Antique style popcorn machine. Just put in your favorite corn, salt, and oil and let the machine do all the work. With it's turn-of-the-century look, this antique popcorn machine promises to be functional as well as a great conversation piece. 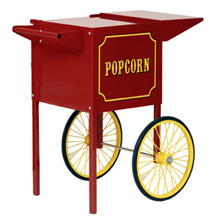 The ultimate addition to any recreation room, family room, home theater, small business lobby or break area is the nostalgic ORIGINAL 1911 BRAND popcorn machine. When comparing to other 4oz models, Pargon is by far the best. Did you know some of the others are made with plastic top and panels? They are much smaller in dimensions and weigh a considerable amount less. Why settle for second rate cheap looking machine when you can have top quality and great looks. Notstalgia combined with new technology. The antique styling of the 1911 Originals is reminiscent of the poppers used by American street vendors almost 100 years ago. These models pair old-fashioned flair with our newest innovations including side hinged, anodized aluminum kettles and extruded side post construction. Black & Chrome. 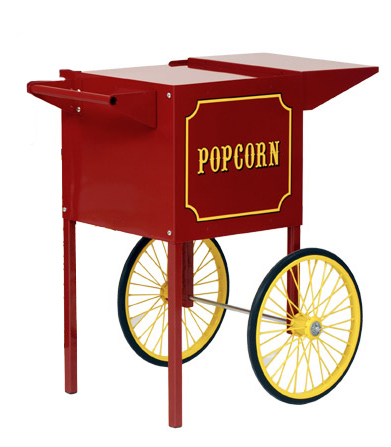 Antique style popcorn machine in black. Just put in your favorite corn, salt, and oil and let the machine do all the work. With it's turn-of-the-century look, this antique popcorn machine promises to be functional as well as a great conversation piece. Complete with popper and matching cart. 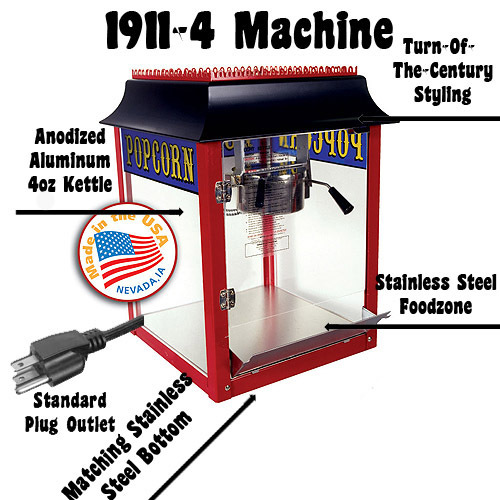 The ultimate addition to any recreation room, family room, home theater, small business lobby or break area is the nostalgic ORIGINAL 1911 BRAND popcorn machine. 21" x 21" x 37"